I already confessed the truth -- even though this is a cupcake blog, I'm having an affair. 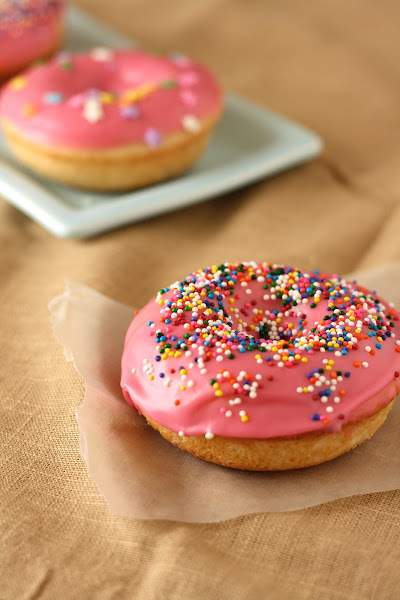 While cupcakes will always be my dependent lover, donuts will always be my secret paramour. Lemon scented cake donuts with a bright pink rosewater glaze! A little bit of background: although I moved around a lot as a kid and have lived in a bunch of different places, I consider my hometown to be Portland, Oregon. One of the things Portland is famous for is a donut shop called VooDoo Doughnuts. Voodoo has a TON of crazy flavors and toppings. You'll find donuts with topped with bacon, Fruit Loops, KoolAid powder, and so on. Remembering this, I was inspired. I wanted to recreate a unique donut that would fit in with Voodoo's selection. 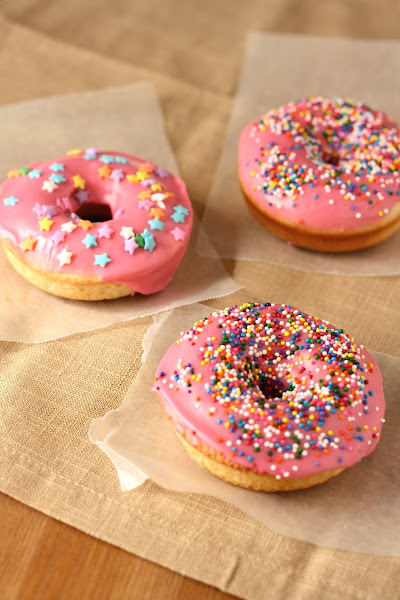 That's why I decided to make a pink rosewater glaze to accompany the vanilla donut. Unfortunately, the rosewater on its own was far too floral and overwhelmed CaffeIna's original recipe. Don't get me wrong, it was still delicious -- just a little intense. I needed something to cut down on the floral-ness. The second time around, I decided to swap out the vanilla for some lemon zest. Although lemon is a little floral itself, I figured that the zest's tartness would help cut down the intensity of the rosewater. And boy, I was right! This second iteration was fantastic. Without further ado, since I present to you the recipe. I hope you like it! Preheat the oven to 375 (F); for sea-level, preheat the oven to 350 (F). 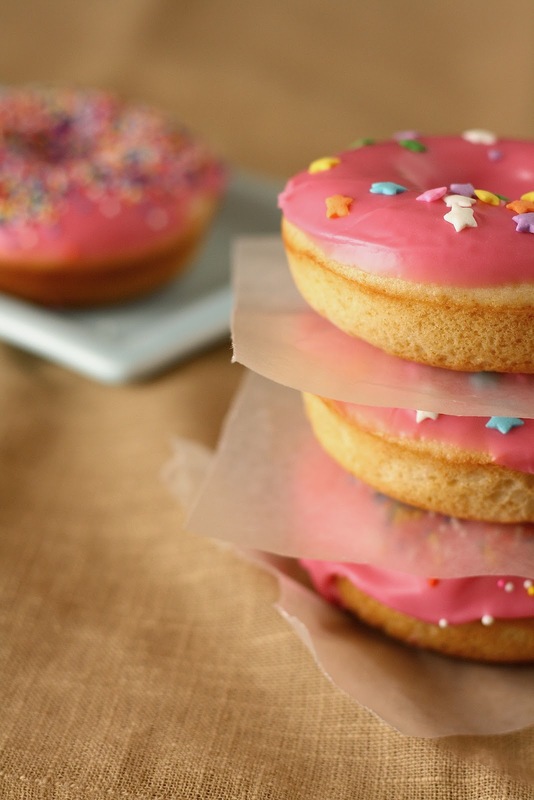 Spray the donut cavities in your donut pan with cooking spray. I like to use Coconut Cooking Spray Oil from Spectrum, but any kind will do. If you don't have any cooking spray, generously butter the donut cavities in your pan. Put 1 cup flour, 1/3 cup plus 1 tablespoon sugar, 1/2 teaspoon baking powder*, and 1/2 tablespoon salt in the bowl of a freestanding electric mixer with a paddle attachment and beat on slow speed until everything is combined. If you don't have a freestanding electric mixer, you can also do this by hand with a regular ol' whisk. Add 1/2 tablespoon melted butter, 1 egg, 3 tablespoons milk, 3 tablespoons cream, and 1 tablespoon lemon zest to the flour mixture. Beat until well blended. Again, if you don't have a freestanding electric mixer, you can stir these ingredients in by hand using a rubber spatula. Once the batter is ready, fill your piping bag (or makeshift Ziploc piping bag :-) ) with the batter and fill each donut hole until two-thirds full. For my donut pan, I ended up piping batter twice around the donut hole-mold. 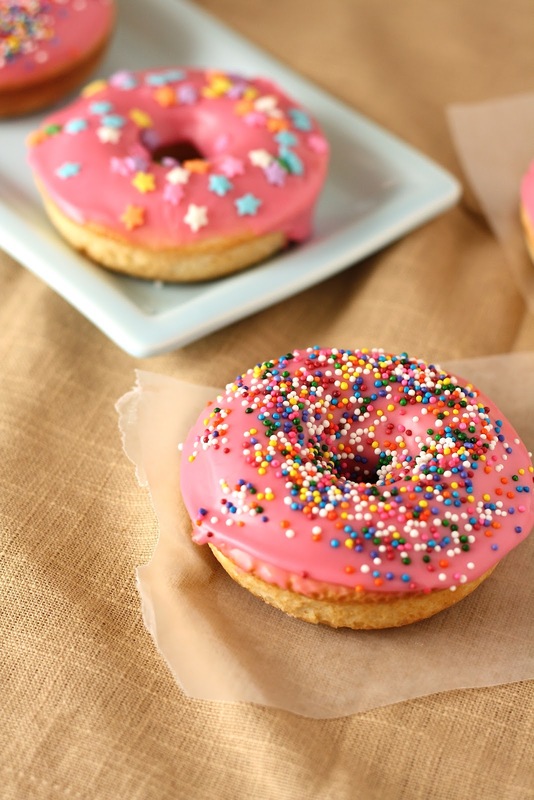 Be careful not to put too much dough into the molds or you'll end up with donuts without holes! Bake for 14-16 minutes (for sea-level, bake for 8-10 minutes) or until the donuts spring back when lightly touched. Don't worry if they look pale -- trust me, the other side will be cooked! 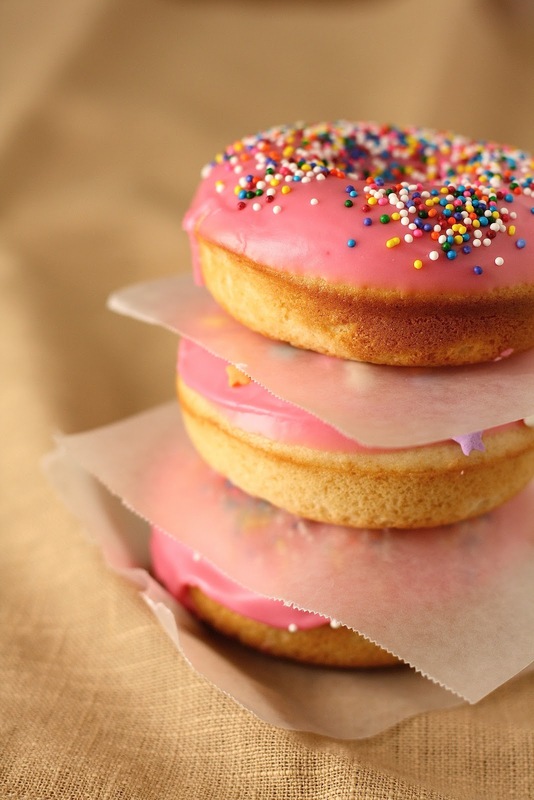 Place the baking tray on top of a cooling rack and let the donuts cool in the pan a bit before trying to unmold them. Once the donuts have cooled, prepare the rosewater glaze. In a small bowl, stir together 1 cup confectioner's sugar, 1 tablespoon whole milk, and 1/2 teaspoon rosewater until the sugar is completely dissolved and you are left with a liquid-paste like substance. Add a couple drops of pink food coloring and keep stirring the glaze until the color is uniform. Use immediately to glaze the donuts! If not, the glaze will harden. The best way I found to glaze the donuts was to actually dunk the top halves of each donut into the bowl containing the glaze. Once the top has been glazed, lay the cake part of the donut on top of a cooling rack with a plate underneath -- this will allow excess glaze from the donut to drip onto the plate. 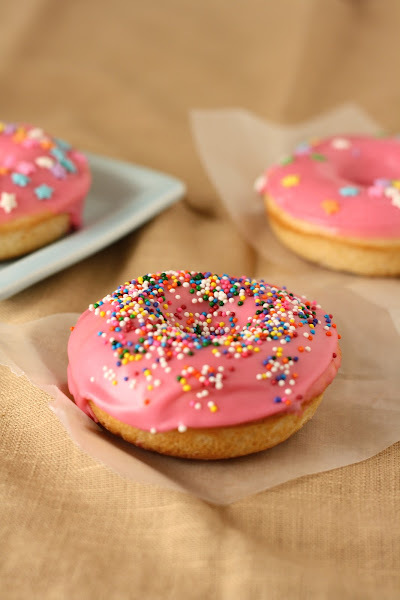 Once the donuts have been glazed, sprinkle immediately with your chosen decorations (e.g., non pareils, sprinkles, lemon zest). If you wait to decorate the donuts, the glaze will harden and the decorations will not stay on the glaze. Just found you via Foodgawker and I love the idea behind your blog. We spend a good part of the year in Telluride ~ where baking can be challenge! These look great Michelle! I already have a donut pan, so I will have to give these a try. nice opinion.. thanks for posting.